Every step in processing coffee; from planting, to selective hand picking, to wet fermentation, has been formulated with extreme care and suitability for Doi Chaang Coffee, accrediting it as World Class Specialty Coffee through various certifications. 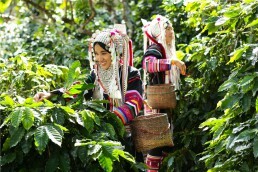 Unique aroma, balanced acidity, low caffeine content, and perfect growing conditions are only some of the characteristics that make Doi Chaang Coffee one of the best Arabica coffees in the world. Freshly harvested coffee cherries are placed in water tanks to sort out unripe, overripe, and inferior cherries. This method allows red, ripe cherries to sink and all others to float to the top and scooped out. Pulping of cherries begin immediately after harvest,where the skin and pulp of fully ripe cherries are removed by energy efficient pulping machines. Following the sorting and pulping process beans are put through a dry fermentation process for 24 hours, followed by a wet fermentation process for 24 hours. The fermentation period naturally removes the outer layer, or mucilage, from the bean. A final 20 – 24 hours of fresh spring water soaking ensures the cleanliness of beans and releases the full effects of the fermentation process. After the fermentation process, the beans are spread over a large clean patio area and allowed to sun dry for 7-8 days. The beans are consistently raked to allow for even thorough, even drying. Once the beans have reached an optimal moisture level they are stored in clean ventilated sacks, under a high altitude weather controlled warehouse. The production of green beans starts at a high efficiency hulling machine where the final layer of parchment is completely removed. The green beans then go through; a sifter, high speed electronic sorter, and to ensure optimal grading, a final stage of hand sorting. Doi Chaang Coffee produces 4 different grades of beans, with a shipping moisture level of 11.5% – 12%. Beans are stored in cotton lined, jute bags kept in a temperature controlled warehouse. Green coffee beans are carefully roasted in a high quality, fully automated roaster and sealed in 4 layer foil bags embedded with one way air valves.